Twitter moved "Moments" for Web and Android viewers Friday to where the Notifications button once was, causing considerable consternation among faithful users. In a nutshell, many in the Twitterati—thanks to muscle memory—are reflexively tapping the Moments button by accident when they want to check their notifications. Numerous tweets accuse the company of tricking users. Hey @twitter, moving the Moments button to where Notifications used to be so I'll push it out of habit still won't make fetch happen. is twitter just moving the moments button further to the left hoping people click on it by accident? Sneaky @twitter moved the Notifications button so I'd click "Moments" first. tsk tsk tsk. @Twitter Please remove the "Moments" button. It makes my baby cry. Is there a setting to hide the Moments button that's now between Home and Notifications on browser Twitter? Make it a link off of Search. 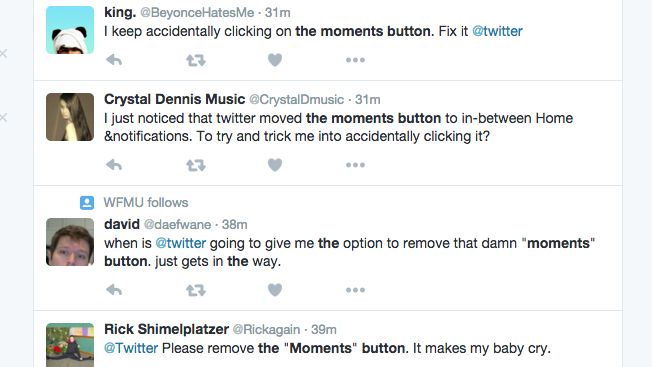 People are evidently also developing tech work-arounds to get rid of the Moments button. San Francisco-based Twitter has declined comment. But the move raises the question about whether or not the social media company is happy with the metrics Moments has been getting so far. The end of the fourth quarter is near, and newly re-appointed CEO Jack Dorsey would certainly like to tell Wall Street investors during the next earnings call that Moments is drawing a big crowd. Twitter has made Moments a centerpiece development since Dorsey came back to the helm. Additionally, Digiday reported this week that Twitter's ads for Moments, called Promoted Moments, have an asking price of $1 million. So it stands to reason that Twitter needs Moments to scale in order to make such a purchase worth it for brands. A source close to the situation characterized this week's buttons move as a test. Moments has not been moved for iPhone users, and it's unclear when or if that will happen. Though the platform's Web and Android audience would seem to represent a considerable roll of the dice, and public companies like Twitter, which is under intense scrutiny from the street, typically do not fix things that are not broken. What's more, in the world of college football, today is the day when conference championships are decided. Twitter, a virtual watering hole for sports fans, will likely overflow with tweets about whether Florida and Iowa can upset Alabama and Michigan State, respectively, from 3 p.m. until nearly midnight. Folks will be glued to Twitter more so than most days. With that in mind, Twitter is running TV spots to push two-month-old Moments during the games, hoping to create awareness and usage of the feature, which curates news and other media to seemingly help the social platform compete with the buzzy likes of Snapchat Stories. One TV spot, seen by Adweek on ESPN during the Texas versus Baylor game, zeroes in on where viewers can find Moments on their Twitter smartphone app—second from the left among a total of four buttons. From a marketing standpoint, the problem is that it's not there anymore for many users. It's now a bit to the left. That's a small alteration to some, but it's probably not what Twitter's agency TBWA\Chiat\Day had in mind when it created the commercials.